Sap beetles are a common nuisance pest in late summer and fall. As the name implies they feed on plant sap, especially fermenting sap from ripe or overripe produce in the garden. They are particularly common on strawberries, raspberries, tomatoes, sweet corn and other garden fruits and vegetables. The best known of the nearly 180 different species of sap beetles is the fourspotted sap beetle, also known as the picnic beetle or "picnicbug." This very common beetle is 1/4 inch long, shiny black and has four yellowish dots on the wing covers. This sap beetle is not content to stay in the garden to feed on over-ripe or damaged fruits or vegetables. They also visit the picnic where they congregate around garbage cans, picnic foods and beverages (especially fermented beverages, leading to one additional nickname, "the beer-bug"). 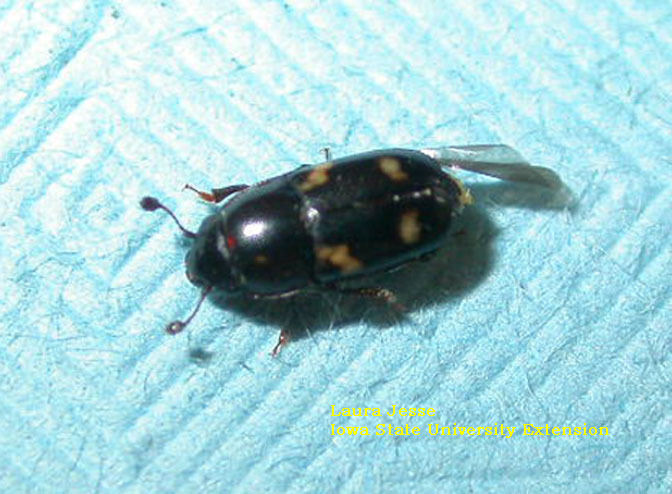 Sap beetles spend the winter as adults and become active in April and May. Damage frequently is low early in the season, but increases as populations increase through the summer. Sanitation is the best management strategy for sap beetles. Keep the garden or fruit production area as clean as possible through timely picking and removal of damaged, diseased and overripe fruits. At the park or backyard, remove garbage and trash promptly and keep foods covered as much as possible. Traps for sap beetles are sometimes used for sap beetle "control" even though there is no convincing evidence of their effectiveness. The theory of trapping sap beetles is to place traps outside the garden, berry patch or picnic area on the assumption that the trap will be more attractive than the garden or picnic. Any container of fermenting plant juices will attract sap beetles. No special design is needed as the beetles will fall in and drown. Common baits include stale beer, molasses-water-yeast mixture, vinegar, any overripe fruit, including my personal favorite pineapple scraps. No specific spacing or distance to place the traps from the produce is recommended though traps should be several feet away from the area to be protected. Discard trap contents frequently. Insecticide sprays are available for sap beetles but they are difficult to use because they are applied to a crop that is ready for harvest or while harvest is underway. If you do spray, use an insecticide with a short harvest-waiting interval and follow label directions carefully. Sevin, or permethrin are suggested for home garden use. Links to this article are strongly encouraged, and this article may be republished without further permission if published as written and if credit is given to the author, Horticulture and Home Pest News, and Iowa State University Extension and Outreach. If this article is to be used in any other manner, permission from the author is required. This article was originally published on July 25, 2007. The information contained within may not be the most current and accurate depending on when it is accessed.